Grassroots limited government constitutional conservatives really don’t want much from the GOP’s Capitol Hill establishment in the Obamacare battle. All we want (really) is for Republicans to fulfill the constitutional role the Framers envisioned for Congress – especially the House – to act as a check on an overambitious and overweening President through the power of the purse. 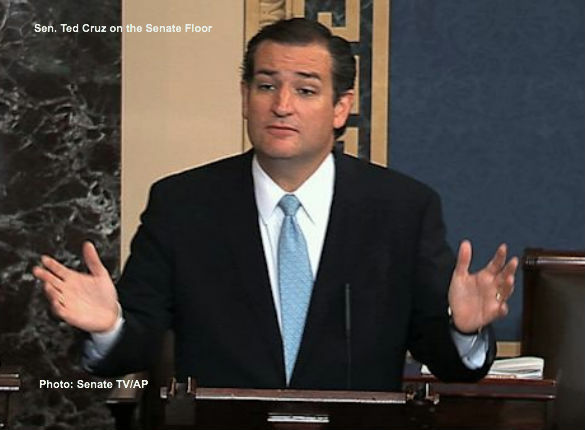 Senators Ted Cruz and Mike Lee get that, so does Senator Rand Paul. So do Representatives Steve Stockman, Tim Huelskamp, Justin Amash, Tom Massie, Louie Gohmert, Paul Broun and a few others. After that the list of those who do, especially among Senate Republicans, starts to get pretty thin. Otherwise they would be on the Senate floor supporting Ted Cruz in his non-filibuster filibuster against funding Obamacare. As big as Obamacare is as a policy debate, the internal Republican debate over cutting funds for it is even more consequential from a constitutional perspective. It goes to the very heart of our constitutional system of government and what the role of Congress is in it. Why is it so hard for the sophisticated insiders of the Republican establishment to understand this? As things stand now, the Capitol Hill Republican “leadership” is saying that Congress is a mere rubber stamp for the fiscal demands of President Obama – if he and Harry Reid want it, then Republicans must fund it. Even if it isn’t working and the people don’t want it. Sarah Palin understands what this debate is really all about – that’s probably why she, Cruz and Paul regularly lead our CHQ 2016 Republican Presidential Straw Poll. The free market, personal liberty advocates at the Club for Growth and Heritage Action understand it – that’s why they have “key voted” the Senate and House votes on the defunding continuing resolution. As Cruz pointed out, it is "asinine" for pundits to always say that Republicans cannot do anything because they control "one half of one-third of government" and said there was a legal term for that argument: "poppycock." This is an argument often employed by House Republican leaders like House Speaker John Boehner (R-OH) and House Majority Leader Eric Cantor (R-VA). Ted Cruz is right: There’s nothing in the Constitution that requires Republicans to fund programs with which they disagree. Indeed, the Constitution contemplates that in a system of “checks and balances” Congress will act as a check on an overweening and ambitious President by reining-in spending and encroachments on individual liberty. Senate Republicans should be united behind Cruz in this effort – but they aren’t and that means that Cruz and Lee will likely lose the vote when the Senate’s Democratic leader Harry Reid finally gets the bill to the floor. That means House Republicans must stand firm against any CR that comes back from the Senate with Obamacare funding in it. If they don’t, then what is established is the principle that the federal government is, in essence, entitled to whatever money is necessary to keep programs Congress created in the past going, whether the people want them or not. And that would be, for all intents and purposes, the end of constitutional government in America.